Hearts boss Robbie Neilson has been censured for the use of "offensive, insulting and abusive language" by a Scottish FA judicial panel. 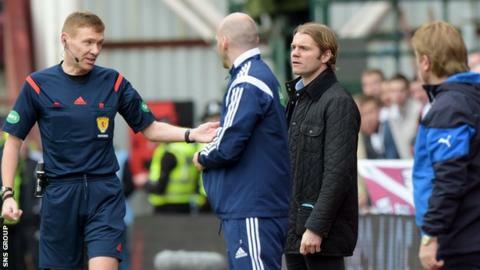 Neilson was sent to the stand by referee Calum Murray during a 2-2 draw with Rangers on 2 May at Tynecastle. He was subsequently issued with a notice of complaint by the SFA compliance officer. Having avoided a ban, Neilson will be on the touchline when Hearts kick off their Premiership campaign in August. Following Hearts' final match of their Championship-winning season, the head coach said: "It's the first time I've been sent to the stand for shouting at an opposition player."